The operating principle of biostimulant (Tinctures) Alokar. 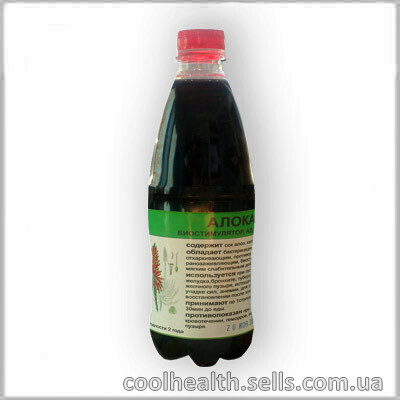 Tincture (biostimulant) Alokar is a powerful anti-inflammatory tool having different absorbing effects. Included in the biostimulant Aloe, Cahors, Honey contain large amounts of nutrients. Let's take a closer look at the healing properties of each ingredient of the biostimulator. impede the process of the formation of cholesterol plaques. has a beneficial effect in infectious diseases of the upper airways and colds. Folic acid, which contained mainly in animal products. Therefore, products containing in its composition of aloe, especially needed for vegetarians. The presence of folic acid is prerequisite of DNA synthesis by dividing the cells in our body. Folic acid, also have a beneficial effect on reproductive function. Therefore, its use is recommended for women planning to get pregnant. Aloe juice has an effect on the body at the cellular level. This herb has antiviral and antibacterial properties, accelerates cell regeneration, and promotes rapid healing of wounds. Contained in the aloe plant hormones, without disturbing the hormonal balance, eliminate the consequences of hormonal failures. The juice of the plant contributes recovery human body immunity (is it immunomodulator). Treatment with honey aloe and cahors recommended conducting several courses a year. Especially, it is the recommendation relating to seniors and the middle ages. This healing tincture cleans the blood, but also prevents the occurrence of cholesterol plaques in blood vessels. children up to 6 years. Taking medication: for 1st.l. 3 times a day for 30 min before meals.